The European Commission has fleshed out its plans for Moldova following acid comments from the Russian ambassador to the EU, Vladimir Chizhov, on Monday (13 January), deriding Europe’s capacity to deal with Moldova's break-away province of Transnistria, which has close ties with Moscow. Asked to comment about Russian officials’ threats towards Moldova concerning Transnistria, Chizhov questioned the EU’s ability to come up with a solution for the break-away province – a frozen conflict zone whose independence is not recognised by the UN – in the framework of the EU-Moldova free trade deal. The question however seems much less worrying to EU officials. “Of course we thought of everything, regardless of what people who have actually nothing to do with these agreements are saying,” said Peter Stano, spokesperson for EU Neighbourhood Policy Commissioner Stefan Füle. In e-mailed comments to EURACTIV, the Commissioner’s office detailed its plans. “The DCFTA will apply to the territory of the Republic of Moldova in its internationally recognised borders”, the Commission says but, it will be up to the Transnistrian authorities to apply the provisions of the deal and to “put in place all conditions necessary”. The Commissionner's office added that it “encourages” Transnistrian authorities to adapt. The DCFTA is an integral part of a deal initialed last November at the EU Eastern Partnership Summit in Vilnius and goes hand in hand with an Association Agreement (AA) aimed at bringing the countries of the Eastern neighbourhood closer to the Union. EU heads of states and governments announced last December that they plan to sign the deals with Georgia and Moldova already in August 2014 to avoid another Ukraine-like fiasco. Many experts consider that the economies of Chi?in?u and Tiraspol are so intertwined and linked to the EU’s markets that Russian threats and “doubts” about how the DCFTA will work in practice bear little significance. Nicu Popescu, senior analyst at the Paris-based EU Institute for Security Studies (EUISS), said that virtually every single Transnistrian company that was exporting goods or services to the EU was registered in the Moldovan Republic with Moldovan documents, stamps and bank accounts, for example. Moreover, 30% of Tiraspol exports are directed to Moldova, while another 40% are directed to EU countries, meaning companies already have to comply with EU standards. “Once the DCFTA is signed, Tiraspol’s companies will need to retain their status registered in Chisinau,” Popescu explained. Popescu highlights the fact that since the Transnistrian economy is almost completely oriented westwards, only “political motivations stand behind a possible refusal to follow the DCFTA” rules in the future. “All complications are easy to solve once Transnistra follows its own economic interests,” he assured, adding that the political agitation on the part of Moscow and of the local authorities will lead to “killing what’s left of Tiraspol’s economy because of political slogans”. Russia could of course use other types of pressure – as the signature of the DCFTA and the Association Agreement approaches – such as trade bans, expulsion of migrant workers and even security threats inside the frozen conflict zone. European Neighbourhood Policy (ENP) governs the relations between the EU and 16 countries - Algeria, Armenia, Azerbaijan, Belarus, Egypt, Georgia, Israel, Jordan, Lebanon, Libya, Moldova, Morocco, Palestine, Syria, Tunisia and Ukraine. In 2009, the EU implemented the Eastern Partnership (EaP), the Eastern dimension of the ENP framework, aimed at upgrading engagement with Armenia, Azerbaijan, Belarus, Georgia, Moldova and Ukraine. The EaP consists of a bilateral track, whose objectives include the establishing of Association Agreements with Deep and Comprehensive Free Trade Areas, once conditions have been met, as well as progress on visa and mobility issues, and a multilateral track, consisting of intergovernmental platforms and flagship initiatives. The Moldovan economy relies mainly on agriculture and exports to the Eastern market, such as Russia, Ukraine and other former Soviet republics. 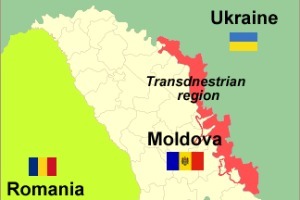 Russia said that Moldova's EU rapprochement would jeopardise the future ofTransnistria, a breakaway territory unrecognised by the international community located on the border between Moldova and Ukraine.